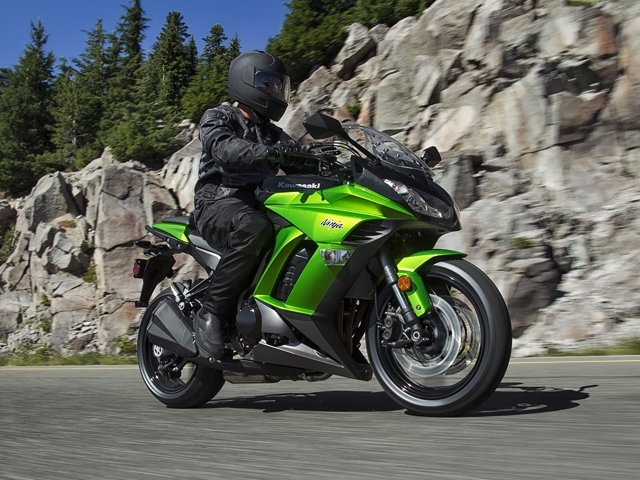 2013 is almost over and so is this generation of the Kawasaki Ninja 1000. 2014 sees a new version of this “street superbike” but how good is the outgoing model and are the discounts worth getting? 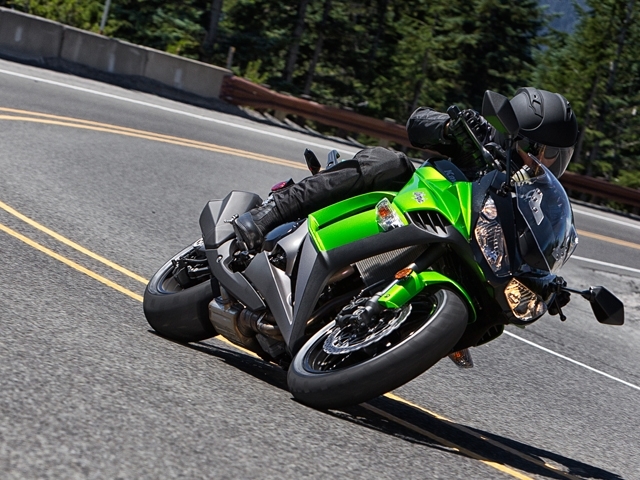 Performance – The inline-4 engine powering this Ninja is a 1043cc displacement producing 138hp at 9600rpm. That may not sound like a lot of power for a 1L bike but it feels stupidly fast. It really doesn’t matter what gear you’re in because one twist of the throttle and the green Kawi takes off like there’s no tomorrow. The powerband is the most liner out of all the motorcycles that I’ve had the opportunity to test drive. If you ever find yourself in a position to overtake a vehicle, like I said before, just twist the throttle and the bike will go. If you do need to shift, the clutch lever is a little on the hard side but the shifter is silky smooth. Around the corners the Ninja is a bit awkward to steer. What I mean is that the riding position is very upright and keeping the bike at an angle mid-corner is quite hard because it wants to be back in the upright position. Having said that, it does inspire confidence when entering a corner and the Nissin brakes provide more than enough power to stop this litre bike. 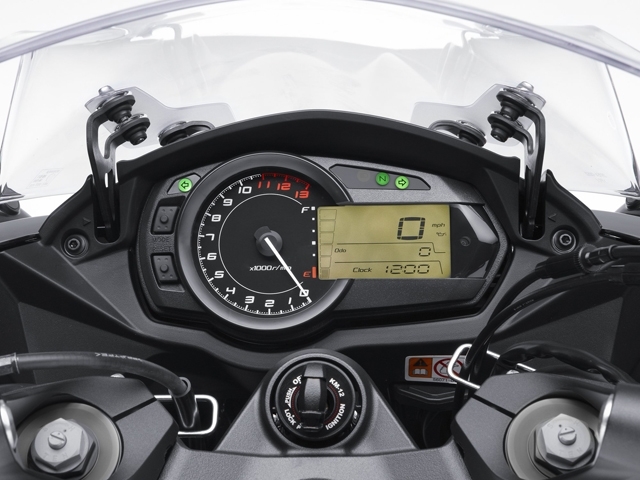 Comfort – As mentioned earlier, the Ninja 1000 has a tall, upright riding position and the handlebars are positioned a little bit towards the rider allowing for a nearly 90° elbow angle. The seat is a little on the hard side for a street bike so your bottom can get numb on longer rides through the country side. The addition of fairings to this Ninja 1000, unlike its brother the Z1000, means that it is less tiring to ride due to the wind resistance. The side fairing provides good coverage for the legs while the 3-way adjustable windshield provides excellent protection for the face and chest. One thing that had me aggravated on this bike was the close positioning of all of the foot controls. On the left side, the foot peg was too close to the shift lever and likewise on the right side with the rear brake lever. Odds and Ends – This bike being a street friendly version of the ZX10R, Kawasaki has taken the effort to make it look different than its superbike cousin. 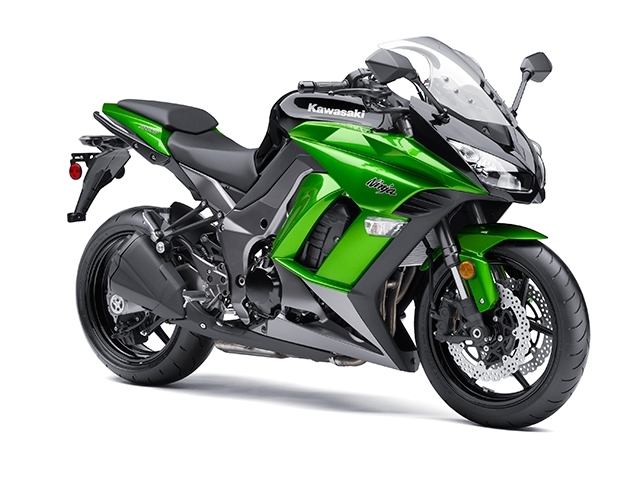 A double sided muffler and air intakes underneath the headlights make this bike look more grown up than the ZX10R. Speaking of mufflers and air intakes, the noise that this bike makes when you open the throttle encourages you to go faster because it is a nice deep bellow that usually only street touring bikes can achieve. 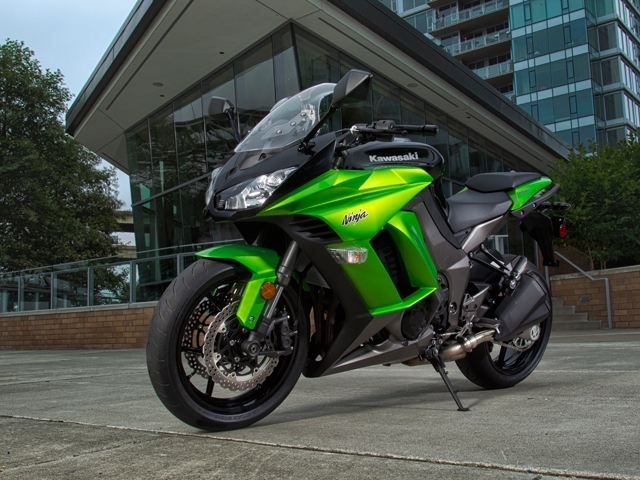 The MSRP of the Ninja 1000 is at a fairly high $14,000 CAD but Kawasaki is offering $1000 off and for sure local dealerships are also enticing customers with further discounts to get rid of their old inventory before the 2014 models start to fill up the showrooms.